First of all let’s get something straight: Great white sharks are not the biggest shark in the ocean. That distinction belongs to whale sharks (40+ feet) and basking sharks (30+ feet). However, since these are gentle plankton-munching giants most people don’t focus on their huge size. No, most are interested in the top predators, the ones that occasionally eat people, and that is clearly the great white (Carcharodon carcharias). Of course there has been a lot of attention on Megalodon (Carcharodon megalodon) which may have reached lengths of up to 60 ft., but they have been extinct for several million years. 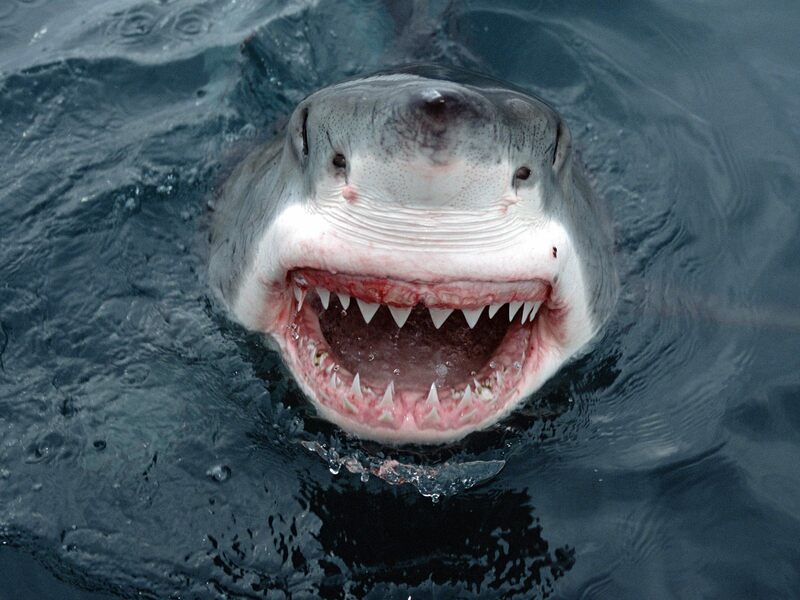 Second, and most importantly, the only thing monstrous about great whites is their size: they can be one massive fish. But among sharks they are surprisingly unique; at times they can be shy, almost gentle. Before attacking they will make several inqusitive passes at their prey, eyeing them for good attack angles, bumping to check reactions. But once they decide to attack they transform into a steamroller of aggression, launching themselves at Polaris missile speeds with their jaws wide open, sometimes flying completely out of the water in full attack mode. To those that know them intimately they have distinct personalities each with unique behaviors (see The Devil’s Teeth for a good read and some great examples). Of course these are wild, untamed animals and should be treated with the enormous respect they deserve. As such, great whites should never openly be hunted; they are rare and precious and protected by law in many places around the world. In truth most of the record size whites were caught inadvertently. 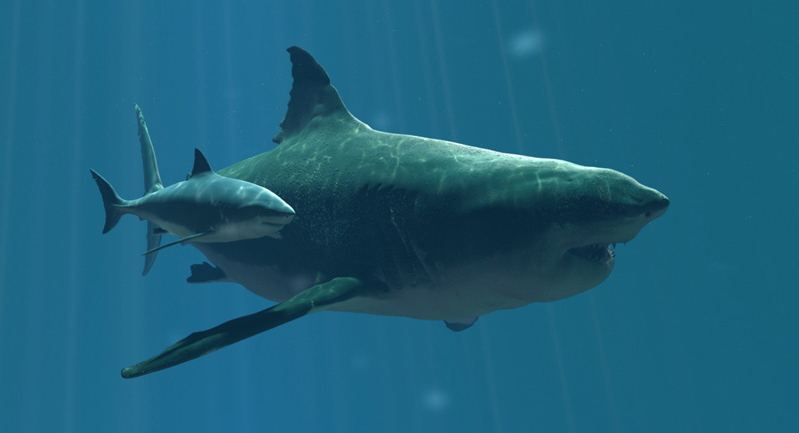 Megalodon (50+ ft), an extinct species of shark next to its smaller cousin, the great white shark (20+ feet). Of the supposed man-eating sharks great white sharks are clearly the largest. But the search to find the largest white shark is not a straightforward tale to tell. Nor should it be. For despite all the movies and the attention given to this single species — only one among some 500+ species of sharks — there is a great deal of mystery around the whites. Until recently we didn’t even know where they spent half of their lives, let alone how big they get. They are also quite rare with 20,000 or less in the major feeding aggregations worldwide. And of course there are the practical considerations: what to do once you’ve captured a 20+ foot, 6000+ lb. snarling, thrashing fish with a mouth of full of large teeth powered by enormous jaws of steel? The impulse for most people, which comes from some tiny primal core of our brain when we remembered we were not the top of the food chain, is to run and hide. One of the last things you are thinking of is: ‘Hey, grab that tape measure and hold it up to the nose so we can measure it!’ Even dead it is quite a chore, as we will see. At the very least you’ll wish you had a bigger boat. Then of course there are legends, myths and fisherman’s tales. Catching the biggest of anything is a huge deal for fisherman and they are well known for their big fish stories. Given the vaulted position of the great white in fishing circles the largest catch is certainly a very high honor indeed. With white sharks their aggressive behavior makes them larger than life, making it even more difficult to capture a rational, accurate measurement of size. Size is, after all, not something that can be objectively measured in itself. We can measure length, width, height, weight, dorsal fin height, jaw width, etc. but size is the sum total of all of these things plus something else: “bigness.” As Buzzy Trent, a famous surfer, once remarked: big waves should not be measured in feet but in “increments of fear.” Perhaps this also applies to great whites as well. Port Fairy jaws at the Natural History Museum in London. So what’s the biggest white shark ever caught? Well for a long time that distinction belonged to a shark caught in 1870 at Port Fairy, Australia which had a reported length of 36.5 ft. (11.1 m)! 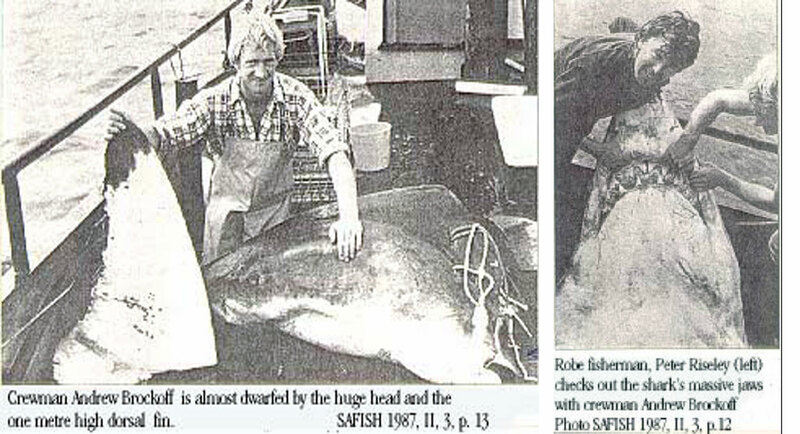 However, because no other white shark was even close to that size, Dr. John Randall measured the teeth of that specimen in the British Museum of Natural History and estimated the shark was actually closer to 16.5 ft (5m) (Randall, 1973). The same was also true of a great white caught off White Head Island in New Brunswick in 1930: originally estimated at 37 ft. Randall calculated it at 17 ft. based on tooth size. “El Monstruo de Cojimar.” Great white shark caught off of the coast of Cuba in the mid-1940s. It allegedly weighed 7,000 pounds and was 21 feet in length. It is often cited as the largest great white shark ever recorded. Source: Wikipedia. The title then switched to the “Monster of Cojimar,” caught off of Cojimar Village in Cuba in 1945: also long considered one of the word’s largest white sharks. Six men captured the shark while fishing from a 14 ft. skiff. After catching it on a baited hook and pursuing it for hours they harpooned the shark, which then rammed and repeatedly attacked the small boat, biting the keel and rudder. When they eventually got to shore (whew!) it was estimated (but not measured) at 21 ft (6.4 m) and 7,000 lbs (3175 kg): a true giant among white sharks, especially when seen surrounded by small children as in the photo above. 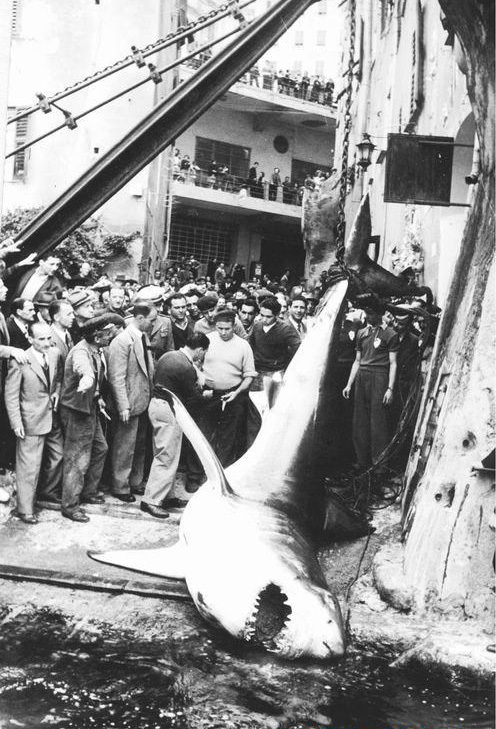 However, later analysis of the shark from photographs revealed that it was probably much shorter, more likely a 16 footer — respectfully large but not a world record. This is fairly obvious from the photos. “Kanga” the record Great White caught off Kangaroo Island, South Australia in 1987. The shark was so big they had to cut it into pieces to get it on board. Since Kanga was never brought on board the ship in one piece its true length and weight were never taken, although Peter Riseley estimated the total length to be > 23 ft. (7 m) by comparing the shark to the distance between fore and aft portions of the boat. 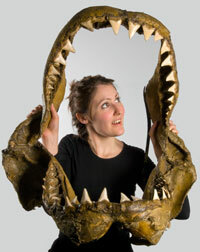 He did, however, measure the jaws as 3 ft (0.91 m) wide and took a few other measurements, which would prove important later. 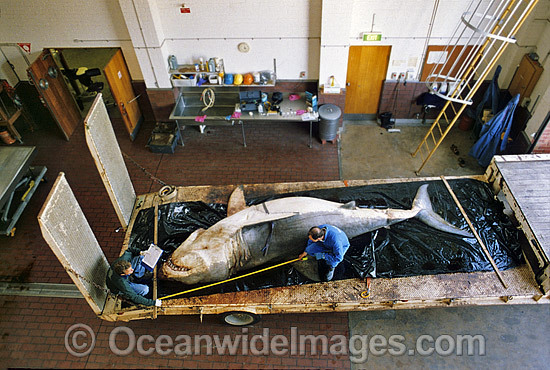 The “Malta” shark, caught off Malta in 1987. It was estimated at 23.4 ft. total length. Interestingly, another massive white was caught several weeks later, near Malta on April 17, 1987, by Alfredo Cutajar, a local fisherman. Using his 16 ft. (5 m) boat powered by a small outboard he was checking his hooks when he noticed that something big was attached. Realizing he needed a bigger boat (smart man!) he signaled to a nearby larger fishing vessel which helped tow the shark to port. When they eventually cut it open it had a completely intact 2 m blue shark, a dolphin of about 2.5 m in two pieces and a 70 cm turtle in its stomach. It later was measured by John Abela at 7 meters and 14 centimeters long (23.4 ft), a new world record. Or was it? Because both of these sharks had some uncertainty about their true size, especially Kanga, an international group of six scientists (Mollet et al., 1996) undertook a study to estimate the length of white sharks based on measurements of their morphometrics, or overall dimensions of various body parts including fins, jaws and teeth of some 70 sharks. Their conclusions were that the most valid estimates of the length of the Kanga and Malta sharks were those originally measured by Riseley and Abela, respectively, both around 23 feet in length (7m). However, the Kanga shark had a larger jaw perimeter and tooth height then the Malta shark and their estimates of length for Kanga, based on overall morphometrics was between 17.3-26.9 ft. (or a mean of 22.1 ft [6.75 m]) while for Malta it was between 15.1-23.0 ft. (or a mean of 19.0 ft [5.8 m]) indicating that overall Kanga was likely the “largest” shark. Of course there are other possible contenders but most have not been measured accurately. For a more complete list of the big whites check out Henry Mollet’s White Shark Summary or the Shark Alley post on the Great White. Both are excellent. Finally, you might be curious how and where the whites get so big and what is their likely maximum size? Size in all animals is determined primarily by age, food, growth rate and genetics. Given the right environment and source of food some whites can potentially be much bigger than others, especially the females which are larger than the males for reproductive reasons. What we know is that great whites change diet from primarily fish to marine mammals as they age which provides them with an amazing source of energy, primarily high fat, that helps them to become large and a more effective predator. It is this specialization on seals and sea lions, and to some extent, cetaceans, that is the key to getting huge, as it likely was for Megalodon. 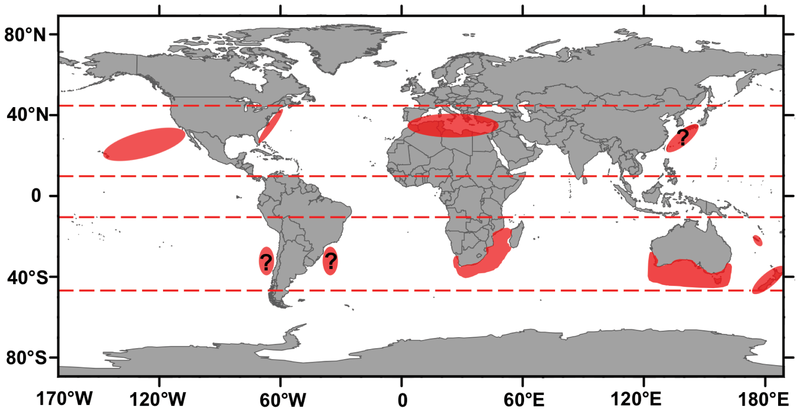 As such there are certain hots spots for great whites where they have a rich food supply in colder waters; these are where all of the record whites have been found so far. Expect to see more in these same areas. The other factor is age. A recent study by Hamady et al. (2014) used radiocarbon analysis to validate the ages of white sharks from the North Atlantic and found age estimates of up to 40 years for a 17.3 ft female and 73 years for a 16.2 ft. male. This study dramatically extends the maximum age and longevity of white sharks compared to earlier studies and indicates two things: 1) big white sharks are much older than previously thought; 2) females over age 40 have the potential to grow larger than 23 ft (7.1 m), the current size record. Perhaps this is part of the puzzle that keeps us engaged in their lore, their mystery, their potential to astound and dazzle us all. Because for all their media attention it is still what we don’t know about great whites that is the most fascinating. The more we learn about them the more we are astounded by their behavior, beauty, their grace, and their role as the quintessential predator: the ultimate killing machine. A large (perhaps 20 ft) great white observed on December 28, 2005, in Oahu, Hawaii filmed in open water by Jimmy Hall. Deep Blue, a 20+ ft. female great white filmed by researcher Mauricio Hoyos Padilla off Guadalupe Island, Mexico in 2013. Randall, John. E. 1973. Size of the Great White Shark. Science 181: 169-170. Mollet, H. F., G. M. Cailliet, A. P. Klimley, D. A. Ebert, A. D. Testi and L. J. V. Compagno. 1996. A Review of Length Validation Methods and Protocols to Measure Great White Sharks. Chapter 10 In: Great White Sharks (A. P. Klimley and D. G. Ainley, eds). Academic Press. Interesting…academic attitude. You cited a picture from the “The Last Frontier” paper but did not read it all all. Thanks for your comment but I’m not entirely clear on what you are referring to. Sure, the “Last Frontier” paper cites 6m as the “largest measured shark on record worldwide” but as pointed out in the paper by Mollet et al.1996 Kanga or Malta may have been bigger based on length estimates from morphometrics. I would love to know the genders of those largest sharks. But I suspect they are female.